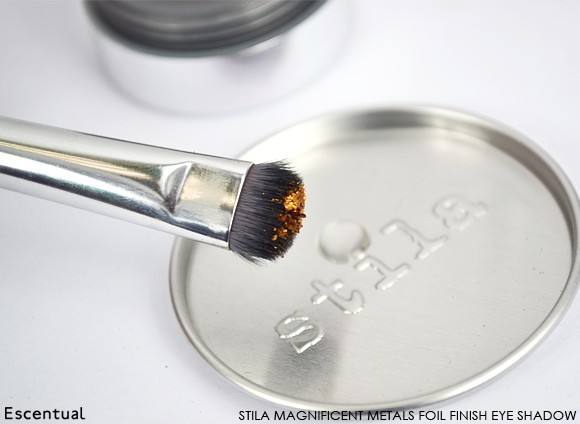 You can always count on Stila for seasonal collections that are completely on point. Their limited edition High Volume winter makeup is abundant with interesting colour and texture combinations that are great for this time of year. 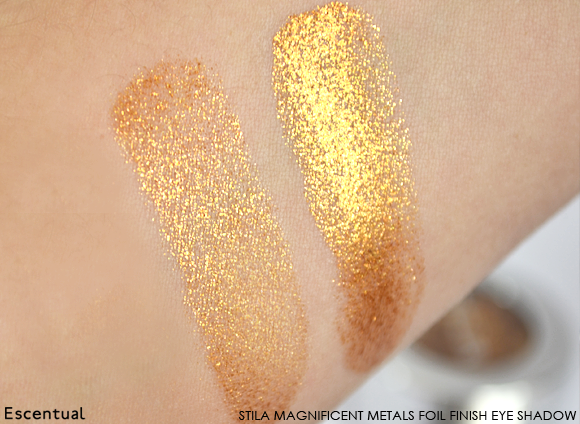 With party season in full swing, now’s the ideal time to jump aboard the metallic train – and the Stila Magnificent Metals Foil Finish Eye Shadow is the way to do it. 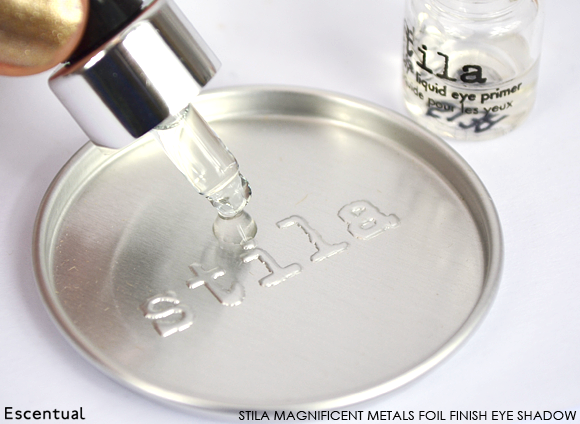 Magnificent Metals comes as a three-part kit made up of concentrated metallic pigment, a miniature Stay All Day Liquid Eye Primer and a mixing tray. The idea is to mix a small amount of primer with some of the pigment to create a molten metal finish that retains its colour, hold and intensity all night long. 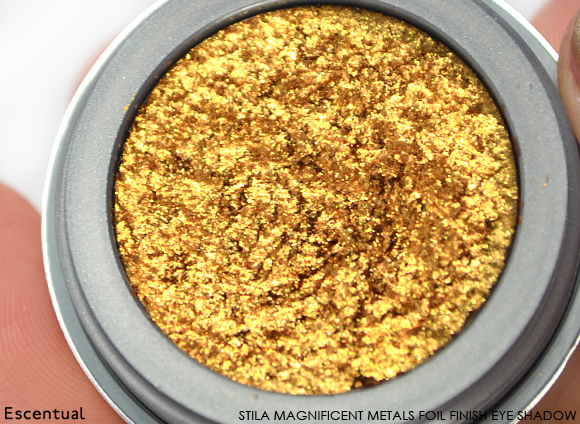 The pigment of the shade Comex Gold is almost like gold leaf, and it’s ideal for a festive eye. It’s extremely concentrated, finely milled and featherlight, with a loose texture that is prone to fallout if not handled carefully. You can use it alone for a swipe of intense colour, but it’s best to use it with some primer underneath to prevent transferring as it’s quite clingy. The accompanying primer is great. Arriving in a miniature bottle complete with a ridiculously cute dinky pipette, one small squeeze dispenses a drop of clear fluid which is more than enough enough to cover both eyes. The texture of the primer is serum-like with quite a lot of slip, meaning that it’s very easy to apply. 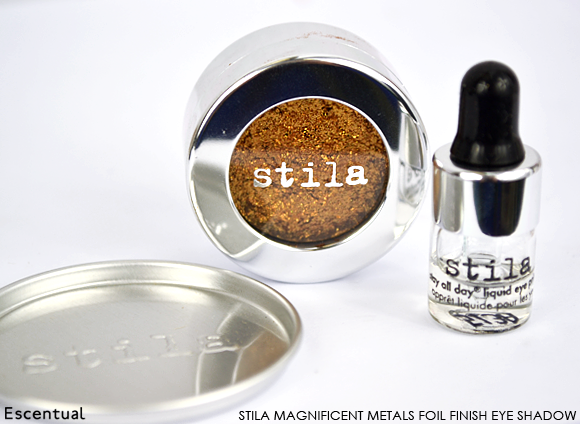 It isn’t sticky, despite the super adherence it gives to eyeshadows, and feels completely comfortable on the skin. Take a small amount of the pigment and mix it with a drop of primer to create a consistency that’s akin to liquid liner. You can then apply it straight to the lid, building it up layer by layer for a more intensely metallic effect, or use a liner brush and tightline the eye for a subtle metallic flash. In the above picture on the left, I created a metallic wash of colour by mixing the shadow with the primer in the palette and applying with a firm eyeshadow brush. On the right, I swiped primer onto the skin and patted the glitter directly on top with my finger for a more intense foiled effect. 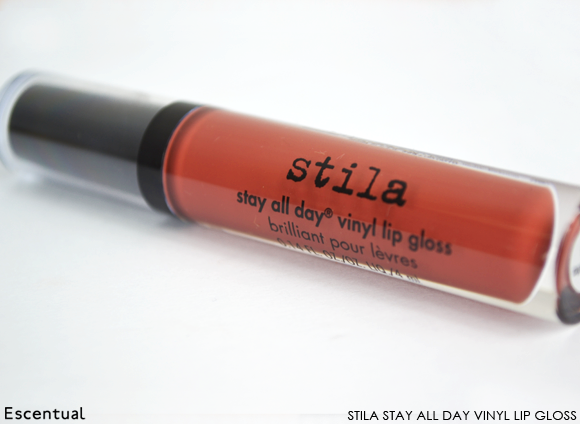 The other star product from the collection is the Stila Stay All Day Vinyl Lip Gloss, a super saturated blend of lacquered shine and pigment that goes on in the morning and stays put all day – that’s almost unheard of for a gloss! 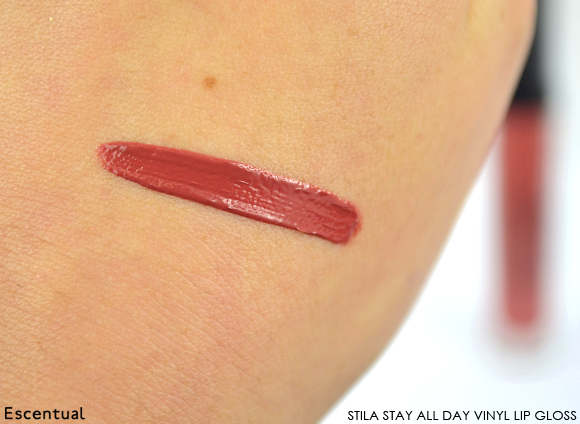 We took a closer look at the shade Terracotta Vinyl, a muted brick red that’s perfect for those who want a bold lip without the commitment of a vivid scarlet shade. The plush doe foot applicator dispenses a nice amount of product. It’s subtly curved to hug your lips, delivering more gloss at the centre rather than the outline, which is just where you want it. The texture of the gloss is quite dense, with an extremely saturated, high gloss finish that is lovely and bold. 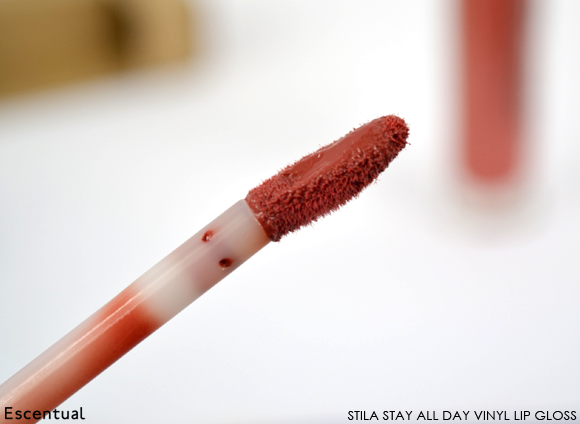 The pigmentation is so impressive that is leaves a subtle stain on the lips, which I actually really like as I tend to bite my gloss off during the course of the day (!). The formula is further bolstered with hydrating green coffee and smoothing seaweed extract to condition lips, making it a real pleasure to wear. 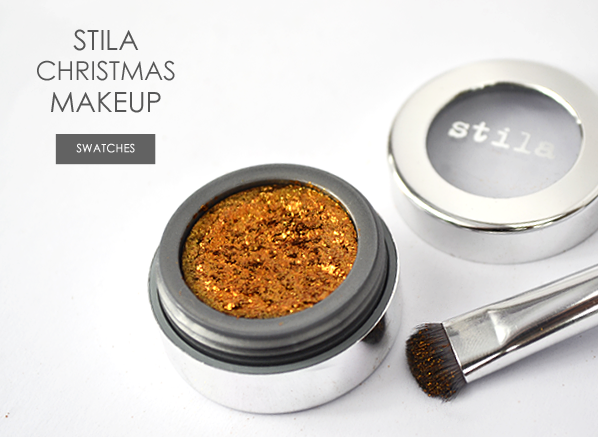 Discover the entire Stila Christmas collection here. This entry was posted on Thursday, December 19th, 2013 at 8:00 am and is filed under Make-up, Swatches, Trends, Tried & Tested. You can follow any responses to this entry through the RSS 2.0 feed. You can skip to the end and leave a response. Pinging is currently not allowed.